With epic stories about Noah, Moses and Cain and Abel all due to hit our screens, is the Bible movie set to take over from the superhero film? Tom Brook examines the potential risks and rewards of the religious blockbuster. 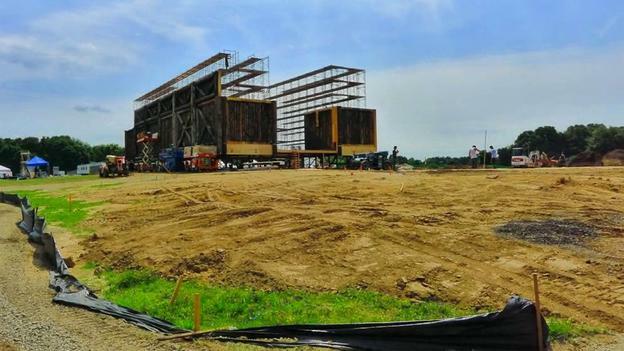 It was an intriguing image and it caught Twitter users' imagination – a massive wooden replica of Noah's Ark under construction in suburban New York. "I dreamt about this since I was 13," tweeted Black Swan director Darren Aronofsky, whose epic film of Noah’s life is set for release next March. "And now it's a reality." This enormous set is a rare extravagance in the age of CGI pictures. And in more ways than one, it looks back to an older style of movie-making. It heralds a flood of Hollywood films on biblical themes. There are two planned Moses pictures in the works, with Ang Lee and Ridley Scott rumoured as directors. Then there’s a Cain and Abel story in development. Sony Pictures Entertainment confirmed last year they’d given approval for production to go ahead through Will Smith’s production company. Other religious films are also being incubated. Hollywood’s interest in biblical epics is to some extent cyclical – in the 1950s and early 60s they were a staple. Legendary filmmaker Cecil B DeMille made a big impact with The Ten Commandments in which Charlton Heston played Moses. Other biblical hits from the time included Solomon and Sheba, David and Bathsheba and Ben-Hur. These films dominated the box office. Recently interest in religious-themed films has been heightened as the Hollywood studios have, once again, come to realise there’s a potentially huge audience for biblical fare. Not necessarily earth-shattering news when you take into account that a Gallup poll conducted last year found more than 75 per cent of Americans identify with a Christian religion. But what’s got Hollywood’s attention in the past few weeks is the just-completed American TV series The Bible on the History Channel. This miniseries – which dramatised the Bible in five two-hour programmes – became a surprise blockbuster. It reached an audience of more than 13 million with its first episode – an unusually large viewing figure for a miniseries on cable TV. Reality TV impresario Mark Burnett, who co-produced the series with his wife actress Roma Downey, clearly thinks there’s a demand for religious entertainment. “We believe in the Bible, we believe in Jesus and that’s the number one subject right now in America. And that’s great!” he says. But catering to the growing interest in biblical adventures presents the Hollywood studios with a challenge: how to create a movie that will engage both secular audiences as well as those who strongly identify with their religious background? Screenplays have to be thoughtfully composed to reach audiences everywhere. It’s not an easy feat if you’re trying to reach a worldwide audience that includes people who practice very different religions. Hollywood has engendered heated controversies in the past when it has taken on religious stories. Biblical characters are seen as sacrosanct. California-based Brian Godawa, a filmmaker who writes and directs spiritual stories, has taken exception to the forthcoming film Noah. Whether or not planned religious movies create criticism, Hollywood is not going to hold back given the promise of big box office rewards. Another strong factor encouraging the studios to explore biblical stories is that Hollywood’s big staple – the superhero films of recent years – may have run their course. “It’s true there isn’t much that is left to be mined but it is clear there is a massive appetite for that kind of story,” says Professor Miller. Religious epics, if carefully calibrated, could perhaps satisfy the appetites of the superhero audience. The studios have already peddled god-like superheroes and met with box office success. Take Thor – the Kenneth Branagh directed action-adventure released two years ago which took in more than $180m at the international box office. Paul Degarabedian believes given the right treatment all the excitement of the Bible – the events, battles and intrigue – could be fashioned into an appealing blockbuster. “That could be something that could totally cross over that would be cinematic, compelling, entertaining that could be huge if it’s done with the proper balance of secular style storytelling,” he says. What some studio executives would like to see is a replication of the success of Mel Gibson’s 2004 religious epic The Passion of The Christ which depicted the last twelve hours in the life of Jesus. The film made more than $600m around the world. Despite considerable controversy – and charges of anti-Semitism – it was a religious film that did reach beyond the US Christian community. It also made headway in countries with large Muslim populations such as Egypt. But it was banned in other parts of the Muslim world for different reasons – partly because the crucifixion, so vividly depicted in the picture, contradicts the Koran. Some commentators see the success of The Passion of The Christ as specifically connected to both the socio-political climate in the US at the time it was launched and Mel Gibson’s stature. He personally financed the film which also benefitted from a very effective marketing campaign that relied heavily on church groups. Right now Hollywood is mired in soul-searching looking for new ways to reach audiences of all kinds both religious and secular. Religious epics remain risky ventures but they could be part of the answer – if done properly the payoff could be huge.